Having My Habit, and Wearing it Too! At this point, wearing a habit is just a dream. Some will say that the habit should be worn at all times, even within the confines of one’s own house. Focusing mostly on the effect that the habit has on the one wearing it, they argue that the habit’s primary function is to remind the professed religious of their inward commitment: just as one puts on the habit in the morning, so too are they putting on a way of life. No matter what one does or where one goes throughout the day, they will be reminded of their commitment. This is a very powerful sign to oneself. Ordinary secular clothes lack the separation from one’s old way of life to capture the gravity of a vowed life. In public, the habit serves as an easily recognizable sign to the others of a religious person. One sister asked me once, “If a mailcarrier wears a uniform, why shouldn’t we?” In a similar way that a mailcarrier’s uniform separates ordinary people from mailcarriers, so too does the habit separate ordinary people from religious. This separation offers a protective barrier from the secular world by drawing clearly distinguished lines between appropriate and inappropriate behavior. The presence of the habit in ordinary situations offers a sense of comfort, purity, and Godliness to those around it that cannot be captured by simply wearing normal clothes. There is a “holiness” that cannot be ignored. It is this very reason why many others have chosen not to wear it at all: the habit creates too much separation. Some religious claim that the habit inhibits their ability to engage in meaningful, mutual relationships with those they serve because it brings with it not just comfort, purity, and Godliness, but also power, authority, and for some, an expectation of false piety. When someone sees a religious in a habit, like it or not, consciously or subconsciously, one’s behavior will be effected; regardless of whether it is for better or worse, people act differently around “brother” X than they would if they had just met X on the street. Many religious find this very troubling, and believe that it is almost impossibile to lead with someone under these circumstances. In this way, some religious focus more on the effect the habit has on it’s beholder than effect it has on its wearer. To accomodate the beholder, thus, some religious have chosen to blend in. Adopting simply clothing, they resemble the very people they serve. This, they say, is the true essence of the original habit; now that it is a sign of prominent status, it must be removed and replaced with something lowly and cheap. By dressing in a more comfortable way, any sort of stigma of being a professed religious is absent from their interactions. They are no longer above others leading down, but instead among others leading together. Those who have adopted this approach tell me that the greatest compliment they receive is, “Oh! I didn’t even know you were a brother/sister,” because it means that their status as a religious brother or sister had no effect on their ability to serve. With that being said, there’s a pretty obvious million dollar question about to be asked: How do I feel about the habit? Do I see it as a part of the identity of a friar and wish to wear it as my default attire? Or, do I wish to live by the spirit of the habit, wearing poor clothes in solidarity with those I will serve? Can’t I have my cake and eat it too? I want to have my habit and wear it too! What do I mean by this? I mean that the question itself is flawed because it should not be an either/or situation; the most complete way that I find to view the habit at this point in my formation needs to include sentiments from both perspectives. For example, I think that the habit is a needed outward sign of inner “habit” that has changed, as well as a being wonderful expression to the secular world, but that sometimes sign value is less important than being in solidarity with the poor and even impractical (or detrimental) when doing extensive manual labor; I believe that it’s important for the uplifting of the laity to blend in and lead as equals rather than create visual separations, while at the same time realizing that the world needs to see good examples of religious in the world, and that no one will ever walk up to us and ask us to pray for them if they can’t find us. In short, I like the habit, but I don’t plan on wearing it every minute of every day. Will I wear it more than I don’t? Probably. Will I wear it to the bank, grocery store, or movie theatre? I’m not sure, but I do think there is a need for the world to see a habited religious in normal, secular places. I understand the desire to lead as equals and the sentiment of not drawing too much attention to oneself, but a the same time, if we only wear our habits to church how will we ever be able to evangelize to those who have never heard the Word or know what a Franciscan is? As it stands now, I won’t receive a habit for another eleven months. A lot could change between now and then. A lot could change when I put it on for the first time. A lot could change the first time I’m out in public and realize that everyone is staring at me. All I can say right now is what I’ve seen so far. Until then, I’m going to dream about having my habit and wearing it too! I like the Franciscan habit, both Capuchin and Observant, but St. Francis originally wore a peasant tunic which was given to him by Bernard of Quintavalle, later Brother Bernard, the first of St. Francis’ .followers. Later, St. Francis changed to a beggars’ robe. 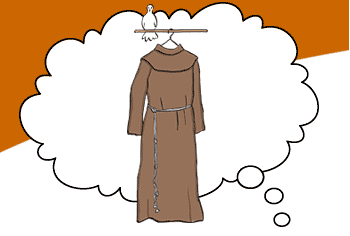 Thus, St. Francis wore the garment of the lowliest members of society. Perhaps modern day Franciscans should revisit the issue of what they wear. Casey, To throw my two cents in: I think that wearing the habit in public serves as a great “advertising” tool. I think there would be more friars if friars wore their habits in public. If nobody sees friars wearing their habits in public, they think nobody is becoming a friar. As to you being “too separated,” I don’t think so. Most friars are down-to-earth people. Upon opening conversations, that becomes very apparent. While I liked what you had to say, I didn’t like the comparison to a letter carrier. Doing that is a job; being a religious is a VOCATION. One signifies what you do; the other signifies what you ARE. So it’s not a good analogy, in my opinion. Having said that, best of luck to you as you pursue your vocation!